This is the second impulse hitting and we have two more left. The Tornado Watch I issued has been extended till later Thursday for the next two stronger impulses. 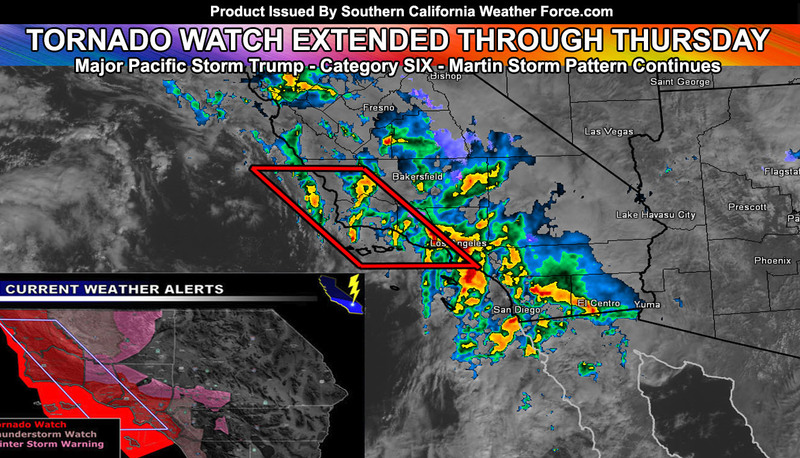 The watch will be for Orange, Los Angeles, Ventura, Santa Barbara, and San Luis Obispo County. Between now and later Thursday there is no way that we will end this storm event without having tornadoes due to the orientation of all the shortwave upper level lows along with strong low level dynamics. A strongly negative-tilted shortwave low pressure system that is Major Pacific Storm Trump (Category 6) is located west of Central California. This wide trough base is allowing for an area of large upper ascent (divergence) aloft. This divergence will overspread the area later this morning and into the afternoon. Instability profiles with the daytime heating will be enough to produce thunderstorms. SCWF Tornado Model is indicating these storms to produce tornadoes. At the surface … A surface low west of Central California is bringing in very strong southeasterly winds across the Tornado Watch zone. . These winds will strengthen as the line of thunderstorms and embedded supercells moves through. With the instability and this southeasterly component atop a jet stream from southwest to northeast creating shear, supercells containing tornadoes are going to be possible. The most likely area will be from Ventura County westward through Santa Barbara and San Luis Obispo County, with elevated values in the LA coast/basin zones as well, as far southeast as Huntington Beach/Costa Mesa … but since all of OC is close enough to the area of upper divergence and thunderstorm risks.. I will issue it for you as well. This is a LONG DURATION tornado watch, which means it will last until later Thursday with each impulse that comes in this week. A line of convection is forming this afternoon and is visible offshore right now just west of Catalina as of 11:30am. This will develop further and move inland through LA/OC/San Diego and the Inland Empire through this evening. The Thunderstorm Watch remains in effect in those areas as instability develops.